A funny thing happens when you Google “sysco chicken-fried steak.” You’re directed to a page on the website of Sysco Corporation, the foodservice giant. It is a catalog entry for the “Country Fried Steaks” that Sysco sells to restaurants. In the sugary promotional copy, these chicken fried steaks “have a natural shape” and a “made-from-scratch appeal.” They’re “individually quick-frozen” and “guaranteed to be preserved to perfection.” It’s enough to make any true Texan weep. I’m not a Sysco hater. Some people profess to never set foot in a restaurant if they see a Sysco delivery truck outside. In reality, it’s a rare restaurant that does not procure something from Sysco, even if it is just something non-food related like to-go boxes. Sysco provides a valuable service to restaurants in a professional manner. But the country fried steak thing bothered me. I’d been tooling around Houston for a couple of weeks, checking out restaurants known for chicken fried steaks (CFS). Like everything else, some were good and some were bad. But on at least two occasions, I could have sworn I had eaten the exact same CFS at a different restaurant. That prompted my Googling. Sad to say, but at least one of these places – somewhat of a Houston institution – had been recommended for having great chicken fried steak (I can’t get them to admit to using Sysco CFS, so they’ll remain nameless for now). I came to realize that the quality of chicken fried steak in Houston just wasn’t as good as it used to be. I grew up in Beaumont, Texas. If you went to public school in Texas in the seventies and eighties like me, you probably remember looking forward to “chicken fried steak” day, or sometimes it was called “veal cutlet” day. These breaded steaks were certainly prefab, but they were unusually delicious, and the trick was to take one of the big fluffy rolls you got with lunch and make a CFS sandwich with them. Good eats. Then in the early eighties, a restaurant called The Black Eyed Pea opened in an old house on Seventh Street in Beaumont. This is the same Black Eyed Pea chain that exists today, before it was corporatized, sold, bought, resold, bankrupted and its carcass picked clean by corporate raiders. 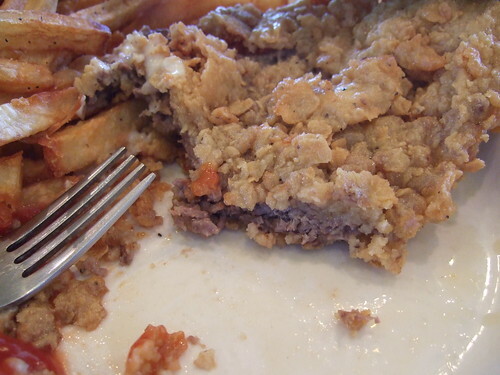 Back then, the Black Eyed Pea made one helluva chicken fried steak (some claim it still does – it’s on my to-do list). So big it covered the plate it was delivered on, it had a crispy, seasoned, golden-brown coating fused to a well-tenderized slab of top round steak. Peppery cream gravy on the side (always). Creamy mashed potatoes. Also, a basket of freshly-baked pull-apart rolls and sweet, crumbly cornbread. A ginormous glass of iced tea rounded out the experience. 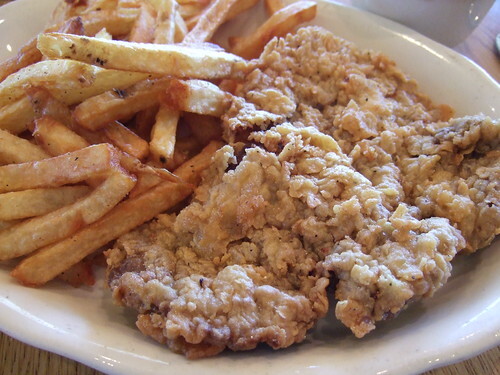 Can you still get a classic, made-from-scratch chicken fried steak in Houston? Yes, but it takes some research (tough job, but somebody’s gotta do it). I’ll spend the next few months traveling around greater Houston, and reporting on my findings. Surprisingly, a lot of the places people swear by for chicken fried steak aren’t very good in my opinion. Some are just bad, some try to get fancy with presentation and ingredients, and some do indeed use the dreaded Sysco chicken fried steak. I start by checking online menus of diners and comfort food restaurants in Houston. 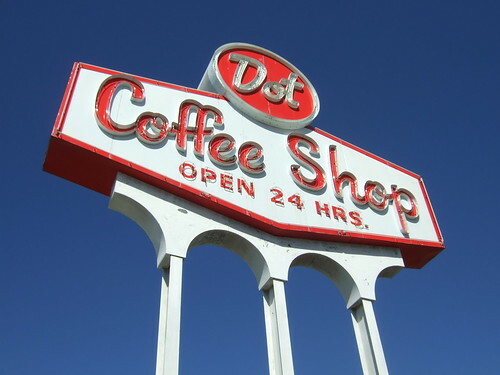 I stumbled across Dot Coffee Shop, a Houston institution, and a place I had never been. Diner food is hit-and-miss everywhere, but I had always heard good things about Dot. Dot is owned by the Pappas family of restaurants. In fact the Pappas family empire started with a Dot Coffee Shop downtown in 1967. The Dot on the Gulf Freeway is still going strong. On a recent Saturday morning, I waited about 20 minutes for a table. The CFS here is nicely sized, with a crisp, crunchy coating that adheres nicely to the well-tenderized steak. The coating is a golden brown, with light and dark patches (you don’t want it too uniform), and a few splotches where the meat shows through the coating (again, the sign of a made-from-scratch CFS). Meat and coating are well-seasoned. It is fork-tender. In a slight deviation from protocol, the CFS is served with French fries instead of mashed potatoes, but that’s fine by me. The CFS extras are excellent. The cream gravy is served on the side, with the proper consistency and peppery flavor. Curiously, there seems to be an undercurrent of onion powder in the gravy, not unpleasant and not unusual, as traditional cream gravy is often spiced up with the flavor of onions, garlic, or Tabasco. When it comes to CFS and gravy, I’m a spooner, not a dunker. I like to spoon some of the gravy on a section of the CFS, then cut off those pieces and eat them. This keeps the coating crispy. Some people like to cut off a piece of CFS and dunk it on the gravy – that works too. I also like ketchup with my CFS; mixing it up with the gravy and some Tabasco is delicious. Finally, the CFS at Dot Coffee Shop is served with excellent pull-apart rolls and cornbread. 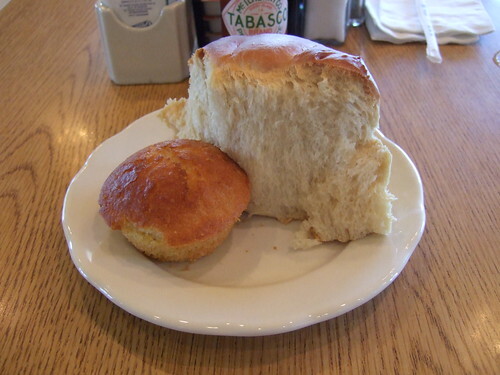 The roll is hot, fluffy, sweet and buttery; the cornbread is moist and crumbly, but not too sweet and not too bitter. A big glass of iced tea and some fantastic people watching round out the classic Texas chicken fried steak experience at Dot Coffee Shop. This entry was posted in 29-95, CFS Challenge, Favorite Dish, Food, Houston Chronicle, Print and tagged chicken fried steak, cornbread, dot coffee shop, pappas, sysco. Bookmark the permalink. Tomball has two places that make killer CFS. Check out Goodson's or Mel's if you're ever in that neck of the woods. Ever up in Spring, check out Mels Country Cafe (melscountrycafe.com) BEST CFS! Other great home cooked foods as well! Aren't the lines long enough? Shhhhhhhh!!!! You eat your CFS just the way I do! Strack Farms also in Spring makes a legendary CFS, highly recommended.